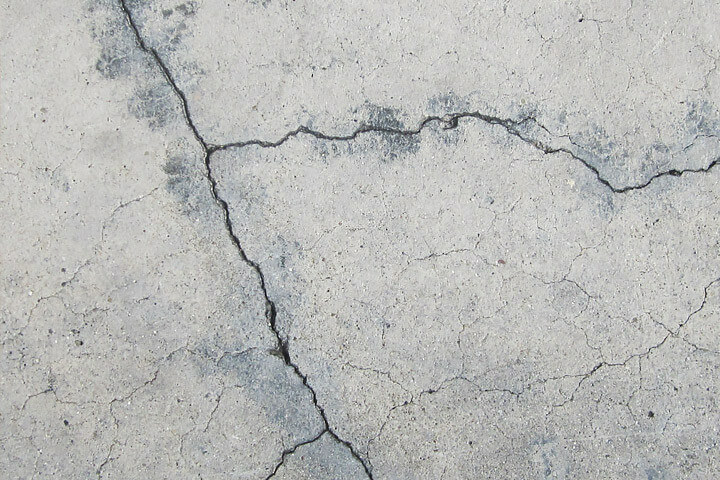 When fresh concrete settles, cracks in concrete slabs can result. Concrete is a mixture of sand, cement, gravel and water. The cement and water chemically react to cause the mixture to harden over time. During the hardening, there is a loss of water, so 1/4 of the original constituents disappears. This causes a loss of volume. Whenever concrete is placed in a thin sheet over a large foot-print area, the dimension change takes place over the foot print. As the concrete tries to contract or shrink dimensionally, frictional forces are generated at the bottom of the concrete and this creates tension stresses in the concrete. Concrete is extremely strong in compression but fairly weak in tension. Hence, tensile cracks or shrinkage cracks in concrete slabs will form to relieve tension stress within the concrete. It is nearly impossible to prevent shrinkage cracks from forming, so smart contractors will place steel reinforcement (such as wire mesh) in the concrete slab to resist cracking. Instead of wire mesh, closely spaced contraction joints can be saw-cut into the freshly placed concrete to create lines or planes of weakness and force the shrinkage cracks to form at the base of the saw cut. If these two things are not done, the concrete slab will develop its own random, often-jagged, shrinkage cracks. This can lead to gapping in glued-down hardwood flooring or cracking in ceramic tile or adhered sheet vinyl. Many foundation repair contractors will tell you that these cracks are signs of foundation failure and recommend expensive underpinning repairs. Don’t be fooled, call one of our engineers to diagnose the problem.